Chinook Nation citizens gather in Tacoma to celebrate a successful day in court. // Photo by Sarah Salcedo, 2018. Since the debut of our film, a wonderful thing has happened for the Chinook Nation: a team of lawyers has offered to represent their case pro-bono. They filed suit in August 2017, and in May of 2018, was heard by U.S. District Court Judge Ronald B. Leighton. 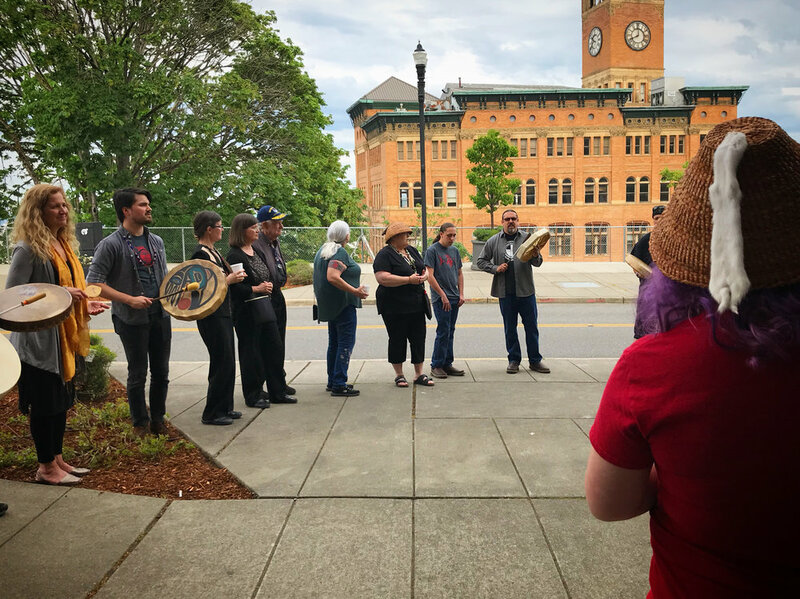 The courthouse was packed with Chinook Nation members, allies from the community, and representatives from other Pacific Northwest nations such Puyallup, Grand Ronde, Duwamish, and others. Seven out of eight claims made by the lawyers for the Chinook in this case have been allowed to proceed, and the BIA's initial call to dismiss was rejected by the Judge. Journalist Natalie St. John gives an excellent summation of the legal victory and what comes next for the tribe that you can read here in the Chinook Observer. King 5, Seattle's NBC affiliate, featured Promised Land on their program, King 5 Evening, on Tuesday, January 17, 2017. Our producer and co-director Sarah was out with the flu, and couldn't join them, but co-director/editor Vasant and Duwamish tribal council member Ken Workman did a fantastic job, as did the Evening team who wrote and edited the piece. "At the September 27 Seattle opening of the documentary “Promised Land,” the writer/director team of Vasant and Sarah Samudre Salcedo recalled their first meeting with Cecile Hansen, Chair of the Duwamish Tribe. They told her about the film they wanted to make of the Duwamish and Chinook fight for federal recognition. Now, three and a half years later, the Salcedos have created a film that follows through on that promise. It will make you mad. But it doesn’t happen all at once, it kind of creeps up on you. The film tells the story of two Pacific Northwest tribes, the Duwamish and the Chinook, and their decades long fight to gain federal recognition. It lets the Native citizens of these two nations tell the story. There is no other narration, just Chinook and Duwamish tribal leaders as well as a few Native and non-Native leaders from other organizations and tribes talking about the effect federal recognition has on Native people." ASTORIA — The social justice documentary Promised Land will make its Oregon premiere Saturday, Sept. 10 at the Liberty Theater, located at 1203 Commercial St. The film chronicles the history of the lower Columbia River’s Chinook Indian Nation as well as Seattle’s Duwamish tribe, telling the story of how both tribes helped settlers and remain integral to Northwest heritage. As both tribes, and hundreds of others like them across North America, struggle against those who tell them they don’t exist, the film examines a larger problem in the way that the government and society look at indigenous sovereignty today. Doors open at 12:30 p.m. and the film screening will begin at 1 p.m. The filmmakers will be in attendance. Council members from the Chinook Indian Nation will be present to sing, drum, and share about the Chinook’s history and future. A raffle with items donated from local businesses and beautiful items crafted by tribal members will take place after the screening. Proceeds from the raffle and a portion of ticket sales will go to support the Chinook Indian Nation. Tickets are $10 for general admission and $8 for seniors and military. Tickets can be purchased at ticketswest.com/events/promised-land/185000/ or by calling the Liberty Theater’s box office at 503-325-5922. The screening is sponsored by the Columbia River Maritime Museum. The film was produced by Tall Firs Cinema. It will be released in select theaters this fall as well as several film festivals. For more information, call the box office or reach out to the film company here. New Trailer and Screening Dates for the Film! We finished the film this spring and we can't wait to show it to you this fall. We're so pleased to announced that it's been accepted to the 19th Annual Local Sightings Film Festival, Joshua Tree International Film Festival, the 12th Annual Ellensburg Film Festival, on top of many exciting regional shows we have planned. We will have dates and ticket information up on the site by the end of the week, but until then, I hope you enjoy the trailer and start thinking of ways to write your representatives (Patty Murray and Maria Cantwell spring to mind) to advocate for these tribes in the Pacific Northwest. We have fantastic news: Promised Land is officially finished. While it is still awaiting its official Pacific Northwest debut, it's already been seen by several North American festivals and won small awards. We are currently in the process of planning the film's festival and university tour. Though the film begins in a specific region, the story it tells is one that countless tribes are going through not only throughout North America, but throughout the world as well. The film ends by expanding its focus to issues such as aboriginal identity, blood quantum, and the struggle of indigenous communities for self-determination. We also just won a grant from 4Culture that will enable us to develop interactive educational materials that will help engage audiences and our educational partners with the history and current events discussed in the film, sharing an even greater depth of information than we had time to provide. We hope to partner with aboriginal communities around world wherever our film is screened to help draw attention to all issues of self-determination that all bands and tribes face in every country. This film is presented without a narrator, so that only the voices of the tribal members themselves, along with their allies, are the ones presenting the story. We hope that all our showings will be avenues for indigenous voices to meet with the community and have their voices heard. We don't want to be the ones doing the speaking; that's never been a goal of the film, to promote ourselves as artists. The goal of this film is to raise awareness of the complex and unjust struggle that the Duwamish, Chinook, and countless tribes like them go through concerning recognition, enrollment issues, blood quantum, and the like. We will be updating the site in the next month with preliminary dates for showings, a new trailer, and more exciting news about partnerships for the film's outreach journey. The poster above (which was designed by the filmmakers and the bear illustration was created by Port Gamble S'Kallam artist, Jeffrey Veregge, who does a lot of work for Marvel and Nike and graciously added his graphic stylings to elements in the film) and the news about 4Culture is just the first of many updates we'll be posting about in the coming months. We look forward to sharing these things and of course, the film itself, with you all this summer. Last Tuesday, while on a road trip up and down the coast filming, we celebrated our one year anniversary working on our documentary, Promised Land. We’ve met so many great people along the way and while we wrap production in July, we know we’ve made lifelong friends up and down the coast. We can’t wait to share this story of the Duwamish and Chinook nations fight for sovereignty with the world. Their fight for federal recognition is an important story not just for the Pacific Northwest, but for the country at large as we, as a country, consider how we honor our promises, our past and how we move forward into our future together. When we look at one small story of these regional tribes; one still lead by the descendants of Chief Seattle, the other led by the descendants of those who fed and sheltered Lewis and Clark and controlled trade up and down the coast as the West was settled; we find we’re looking through a key hole at a larger story that connects us all: the immigrants and indigenous alike. Sponsored by San Francisco Film Society! We’re really excited to announce that our film, Promised Land, has been sponsored by the amazing San Francisco Film Society. We’re so honored to have access to their resources, partnership and advice as we work on our documentary. This has been an exciting journey so far, but it’s also been rough. Doing anything you love is hard because it takes all of you: all of your time, all of your resources, and most of all, your heart. You put all that you have of yourself into a creative work, and that can leave you feeling pretty vulnerable. That’s why it’s been wonderful, and an unbelievable privilege to ally with such a great force in the filmmaking world. We’re ecstatic moving forward with this amazing story having such a great vote of confidence in this film in place. Here is the San Francisco Film Society page on our project! There’s a blurb up about the film, and a place to donate. It just means a lot to be listed on their site. The Hollywood Reporter did a fantastic article on San Francisco Film Society and how it’s become a game-changer for the film world in the last few years. Seriously, have I mentioned that we’re excited about this partnership? If I haven’t, let me know. I can keep on repeating myself. What’s next for us? We have a lot of exciting things in the works, but we’re continuing to be tactful about when we release the full information about the film until we’ve reached a certain point in production. What you can look out for is our first trailer, which should be released within the next month! Stay tuned and thanks for your support! Details about the film (which just went into production) are coming soon! We’re really excited to share with you all what we’ve been doing for the last six months. Until we give you the great big announcement about our film, we’ve at the very least got a teaser poster to share. Enjoy!